The mouth possesses several social attributes. More than just a simple tool for communication, it is a symbol of beauty and sensuality. Aesthetic surgery can prolong your mouth’s youthfulness. The mouth is a symbol of youth, attraction and sensuality. It should be well formed, and the lips clearly defined and plump. The lips are made up of an external face, with a structure identical to the skin, the white lap, which blends into the vermillion or red of the lip, whose colour depends on the abundance of blood vessels. The median zone of the upper lip, the philtrum, is limited by two vertical crests called the philtral crests or ridges. The red lip (or vermillion) is separated from the white lip by a balanced, well-defined bulge (called ‘cupid’s bow’ for the upper lip). The upper lip should not be more than 2/3 of the size of the lower lip. The height of the upper lip should be 10-20% less than that of the lower lip. The upper lip projects 2mm beyond the lower lip. 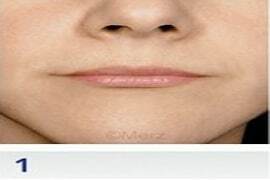 The upper lip is longer than the lower lip and has an M shape. The lower lip has a W shape. The white lip is concave and the red lip convex. The Cupid’s bow is well defined and the philtral crests well highlighted. The summit of the Cupid’s bow passes through the centre of the nostrils. The edges of the labial commissures pass through the centre of the iris. The naso-labial angle is between 90°-95° among men and 110°-120° among women. The width of the lips should be equal to the distance between the two pupils. In relation to Ricketts’ Line E (a line traced from the tip of the nose to the pogonium, the lower lip should lie 2mm behind this line, and the upper lip 4mm behind it. Steinert’s line S (an oblique line traced from the pogonium to the middle of the columella) must touch along both lips and allow us to see if the relationship between the upper and lower lip is correct. if we give a value of 1 to the base of the nose at the columella, the width of the mouth will be 1.6.
if we give a value of 1 to the distance columella-upper lip. the distance between the lower lip and chin tip will be 1.6.
clearly defined contour, the upper lip has a well-defined Cupid’s bow and vermillion, and both lips have a similar volume. rounded shape, and very centred, the Cupid’s bow is flexible and well defined. thick, very pronounced lips, which project forwards, their significant volume blurs the classic shape of lips, and the cupid’s bow and vermillion are well defined. 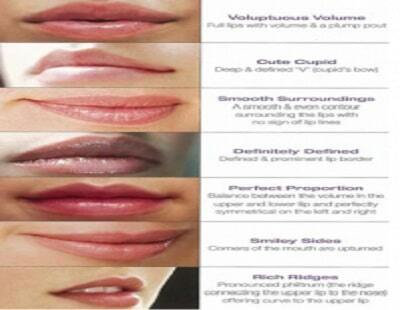 narrow shaped lips with a subtle contour, regular appearance and which are less voluminous than others. The volume of the upper lip is slightly greater than the lower lip. 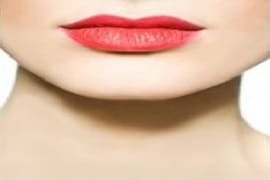 elongated, regular shape, and average volume, the lips look wide and almost ‘stretched’, there is a wide Cupid’s bow, and the volume of the lower lip tends to be greater than the upper lip. The most common. 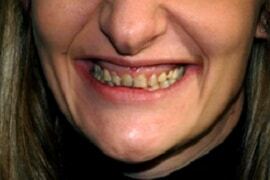 The commissures lift towards the exterior, and the upper lip lifts to expose the upper incisors. 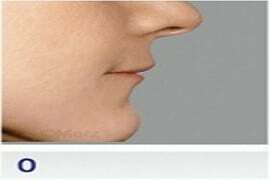 The commissures lift by 7 to 22mm at an angle of 40 degrees in relation to the horizontal, and reach above the upper lip. This is called the Cupid’s bow smile. Rare. The lips draw back at the same time in all directions: the upper lip is raised, the lower lip descends and the commissures move. The second most common.Characterised by a raised upper lip, revealing the incisors and canines, followed by movement of the commissures. The commissures usually remain lower than the upper lip. This is called a diamond form smile. 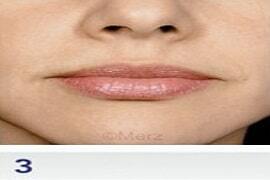 Hyaluronic acid injections to the lips are administered via needle or cannula. Injections to the rear of the orbicular muscle cause a ‘turning out’ or eversion of the lip, whilst injections to the mucous and hem of the lip increase the height of the red of the lip. The injected product must be very supple and flexible, and several products exist which have been specifically conceived for this function such as Restylane kysse. – Definition of the philtral crests. 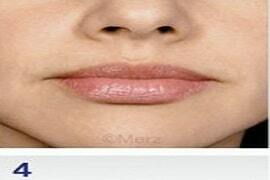 – Augmentation of upper and/or lower lip volume. – Treatment of sagging labial commissures, following an age-related fall or droop. Un fil tenseur peut être utilisé pour relever la lèvre supérieure en raccourcissant la lèvre blanche et en augmentant la rouge. Le geste est réalisé sous anesthésie locale, le fil tenseur est placé en partant d’un point sous le pilier du nezet en l’orientant de part et d’autre de la lèvre supérieure vers la fin du sillon nasogénien. This treatment gives a slight result in case of sagging of the skin due to age. The upper lip was very well redesigned. The result is just incredible! She respects your wishes and advises you to obtain an harmonious and natural result. I highly recommend her, my lips are now beautiful! Doctor Romano rep lumped my lips, the result is natural. She has an expert eye and assured gestures. A great talent, my lips are now perfect, I’m really happy with the result. Recommended.